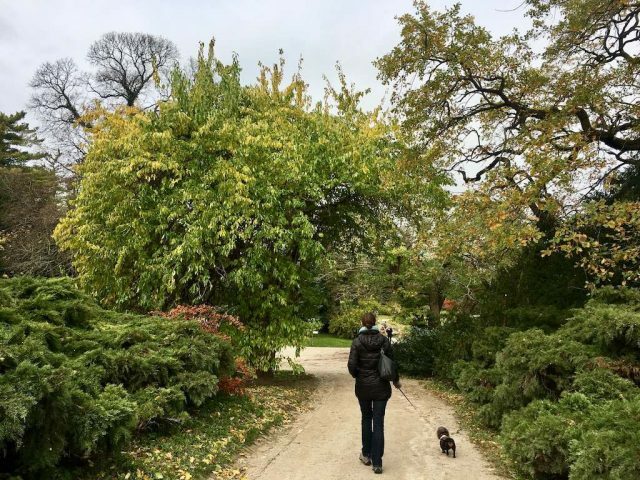 On my recent visit to the Czech Republic, one of my highlights was an autumnal visit to Lednice Park. 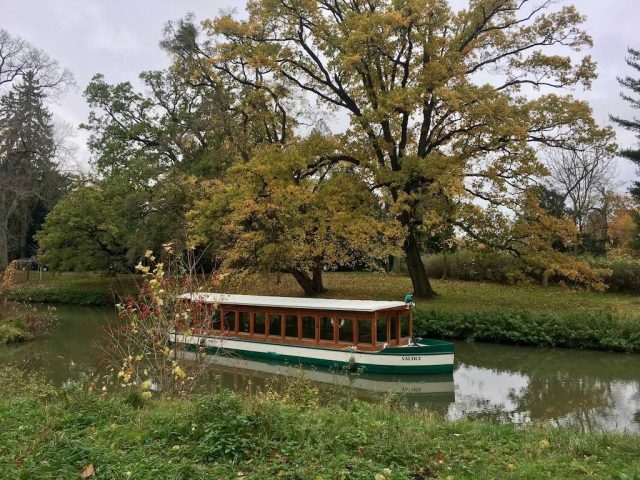 I visited the park as it is part of the Lednice-Valtice Cultural Landscape World Heritage listing, and my husband and I are attempting to visit every UNESCO World Heritage site around the world. 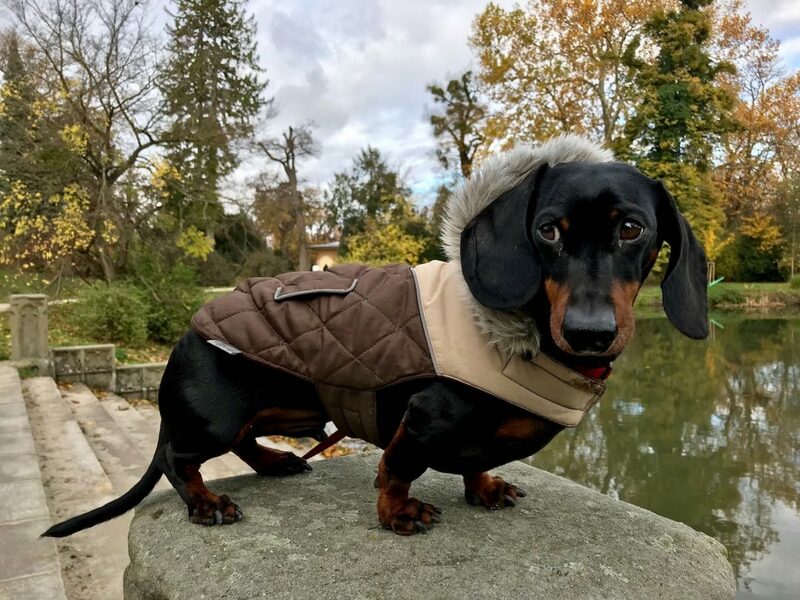 But this park won me over in particular for its beautiful scenery and being an excellent dog-friendly day out, whether from within the Czech Republic or Vienna. 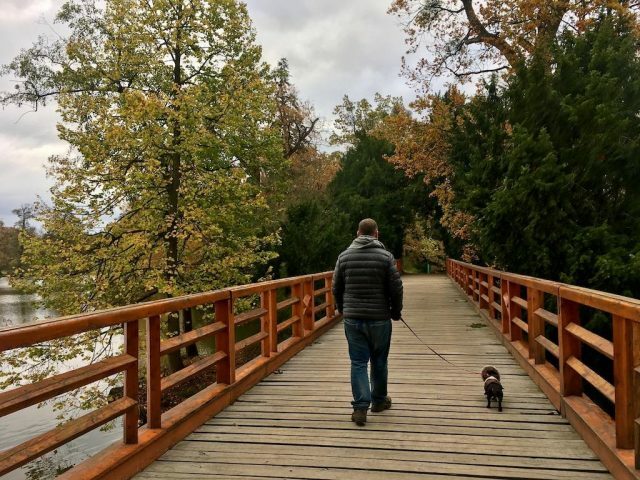 Here’s everything you need to know about visiting Lednice Park with a dog. The chateaus and parks of Lednice and Valtice formerly belonged to the Liechtenstein family, the rulers of present-day Liechtenstein, at the other end of Austria. Up until shortly before World War II, Valtice Chateau was the family’s ancestral home, while Lednice Chateau was their summer palace. However, the area was confiscated by the Nazis during their invasion of the region just before World War II. 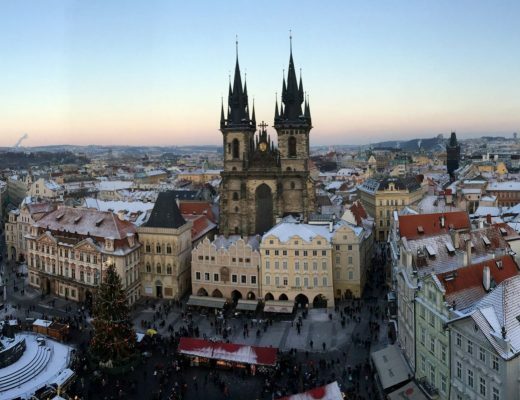 After the war, the area became part of Czecheslovakia, with the chateaus not returned to the aristocratic family. It’s still part of present day Czech Republic, right next to the border with Austria. It became a UNESCO site in 1996, partially for being one of the largest artificial landscapes in continental Europe. 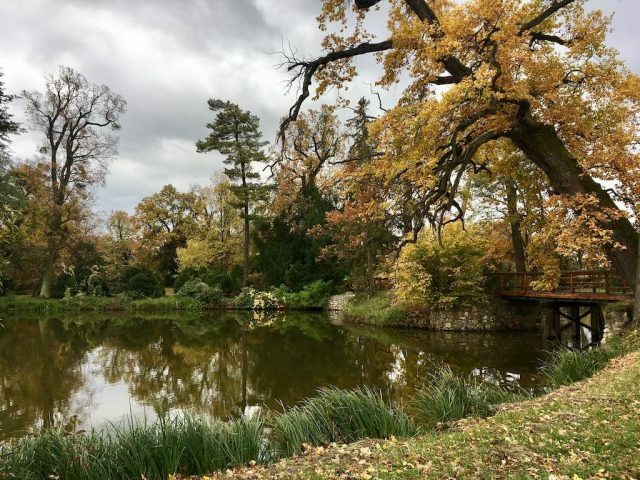 Lednice Park is laid out in the English garden style, complete with multiple romantic follies and a beautiful lake. 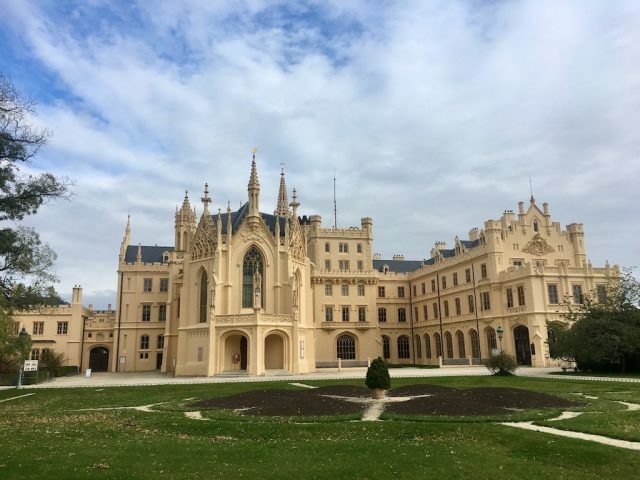 While the key attraction for many visitors to Lednice is the beautiful 19th century neo-Gothic chateau, the palace and other buildings are closed on most days over the winter (check opening hours here), including on the day we visited. Plus if you’re travelling in Europe with a dog, it’s not the best option for a day out. In contrast, the beautiful gardens and parklands are perfect for a dog-friendly day out. 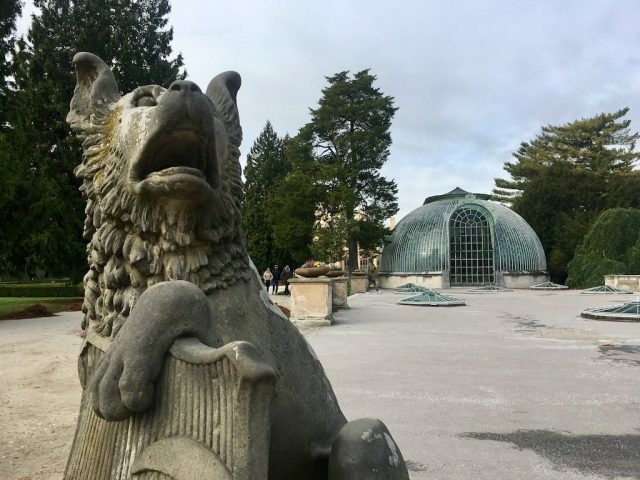 While the gardens of many famous palaces don’t allow dogs, such as Schönbrunn in Vienna and Versailles outside of Paris, dogs are allowed in both the small formal gardens and the park at Lednice. Even better, the parks is still open when the palace is closed, and entry is free for both human and canine visitors. Note that dogs should be kept on a leash at all time. During our visit, ourselves and our dog, Schnitzel, spotted a few Red Squirrels. While I’m sure the cute critters would be too fast darting back up the trees for most dogs, it’s better to be careful. 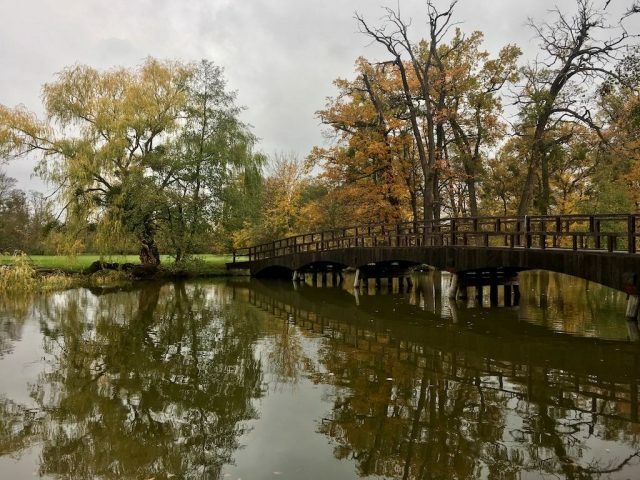 Lednice Park is easily accessible to travellers in both the eastern Czech Republic and the area of Austria around Vienna. It’s best accessed by car. From Brno, it’s about 45 minutes, while from Vienna it’s still only a 75 minute drive, just across the border. There are multiple parking lots scattered around the town, generally with a small parking charge. Outside of peak season, it’s best to park outside the Tourist Information Centre, directly next to the Chateau. Just inside the entrance to Lednice Park, next to the Chateau, is the formal French garden. During our visit in late October, there was not much remaining in the flower beds, so we skipped walking around the area. However, during Spring and Summer this is sure to be a highlight. Instead, we spent most of our time taking the 3km loop walk through the vast park, to the so-called Minaret watch tower. One of the many follies in the park, this 62m tower was reputedly the tallest minaret outside of the Middle East when it was constructed in the late 18th century. 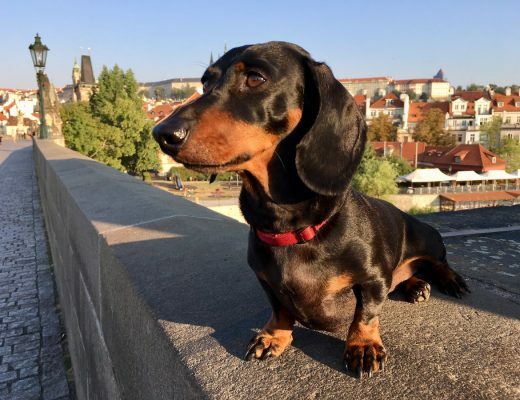 The tower is open to visitors except for over the winter, with a 40 kc (less than €2) per adult entry fee, although dogs will need to stay down the bottom. Along the walk there are beautiful views across the lake and multiple bridges to cross, particularly on the western part of the loop. Allow 1-2 hours depending on how many stops you make along the way. 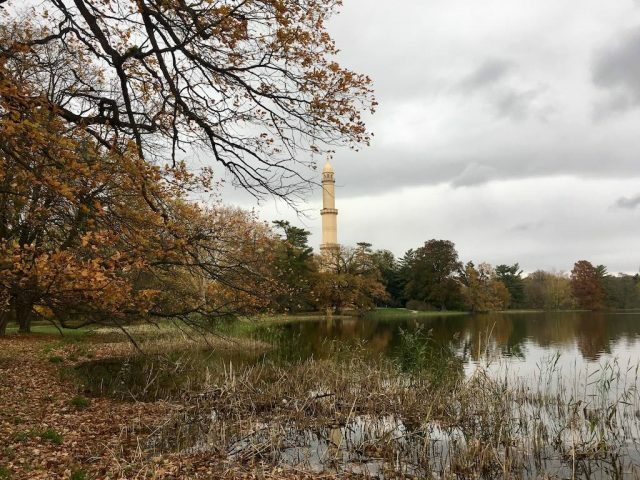 If you don’t wish to walk the full distance, there is also a boat cruise in operation except for over the winter, that you can take to close to the minaret. It takes about 25 minutes and costs 120 kc (about €4.50) per adult one way. I would expect that dogs are allowed on the boat. Alternatively, for a longer walk, take the turn-off to John’s Castle. This side path is a little over 1km in length. 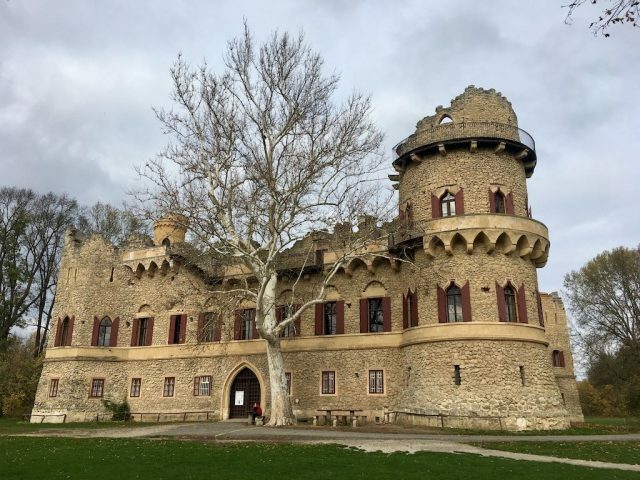 While John’s Castle at first glance looks like a ruined medieval castle, it was actually built during the early 19th century complete with imitation ruins. Next to the boat house is a small cafe that offers drinks and toasted paninis at cheap prices. Eating a panini each under the picnic umbrellas was an ideal light lunch while waiting for some light rain to clear, although I’m not sure of its opening hours year round. Alternatively, head into the township for multiple restaurant options. We generally found many Czech restaurants allow dogs, but always ask. If the weather is warm, there’s naturally plenty of outdoor seating meaning that this isn’t an issue. While in the area, it’s worthwhile stopping at Valtice to see the enormous chateau, plus potentially searching for some of the other follies and lodges located around the area. Ask for details at the Tourist Information Centre. 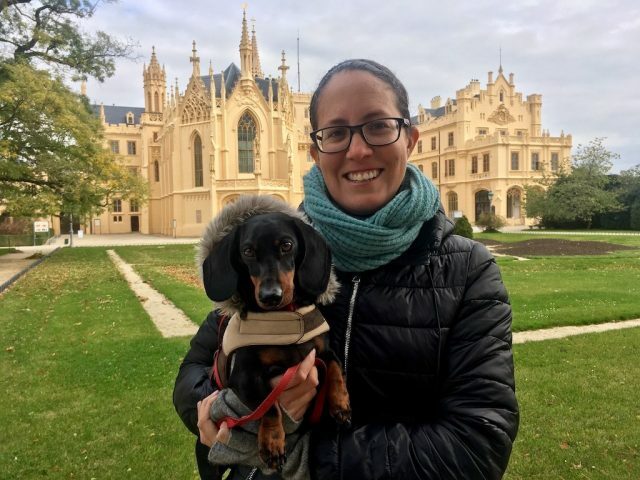 Schnitzel and I wish you a wonderful day at Lednice Park!